Tottenham Hotspur made a world-record profit of £113m after tax last season. The figure tops the £106m profit posted by Premier League rivals Liverpool earlier this year. 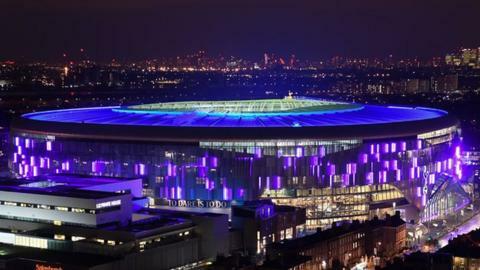 Yearly financial results for 2017-18 reveal Spurs' income climbed from £310m to £380m thanks to player sales, bigger crowds at Wembley Stadium and reaching the Champions League knockout stages. The figures were released as the club opened a new £1bn stadium - though much of that cost has been met with loans. Premier League matchday revenue more than doubled from £19m to £42.6m thanks to playing in front of larger crowds at Wembley while the new stadium was under construction. Tottenham beat Crystal Palace 2-0 in their first game at the new ground. It left the side third in the Premier League, one point in front of London rivals Arsenal and Chelsea and three points in front of Manchester United in sixth place. The financial results show the club is still some way off competing with other top six sides financially, however. Last season, Tottenham spent £147m on player wages, for example - almost £100m lower than Arsenal's £240m wage bill, the next lowest of the top six clubs - and about half that of Manchester United. The annual results filed by the club also show £116m was spent on new players in the period, with the likes of Brazil international Lucas Moura and defender Serge Aurier both coming in from Paris St-Germain. However, the club also made £84m back in player sales - defender Kyle Walker's move to Manchester City providing more than half of that.